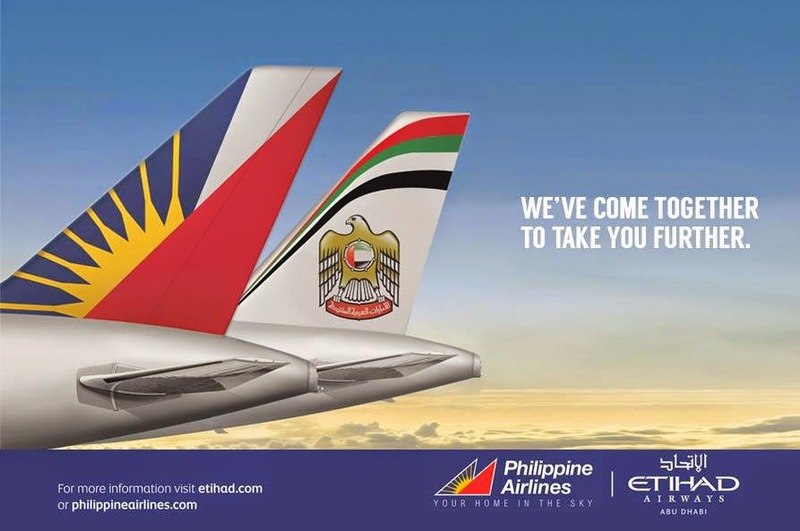 Aviation Updates Philippines - The National Flag Carrier, Philippine Airlines, and Etihad Airways of Abu Dhabi, signed an agreement which covers codeshare flights, loyalty programs, airport lounges, joint sales and marketing programs, a Philippines domestic air pass, cargo, and the coordination of airport operations to provide a better guest experience at their Abu Dhabi and Manila hubs. Philippine Airlines President and COO Mr. Ramon S. Ang and Etihad Airways President and CEO Mr. James Hogan with the lovely flight attendants. "This new agreement is one of the ways by which PAL hopes to further build its global network. By harmonizing our products, we get to offer our passengers much wider and better travel options all over the world while boosting economic activity for both our countries through trade and tourism," Philippine Airlines President and Chief Operating Officer, Ramon S. Ang said. 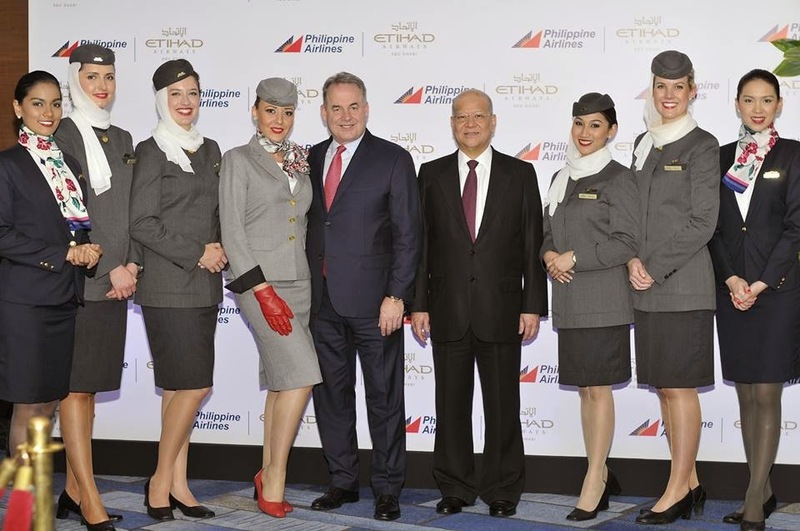 The broad scope of the commercial agreement reflected the strength of the relationship between the airlines and the close ties between the United Arab Emirates and the Philippines, Etihad Airways President and Chief Executive Officer James Hogan said. "What is particularly significant about the new commercial arrangements is that our millions of customers are the winners. From a greater choice of passenger and freight codeshare destinations, to reciprocal loyalty program benefits, and more efficient terminal operations – this is a truly customer-centric proposition," he said. Philippine Airlines and Etihad Airways will initially put their "PR" and "EY" codes on each other's flights between Manila and Abu Dhabi to operate a combined total of 19 weekly flights between the two cities. Etihad will also place its "EY" code on Philippine Airlines flights from Manila to 20 destinations throughout the Philippines in the first phase. This will increase to 28 within the year. Meanwhile, the members of Philippine Airlines' Mabuhay Miles Frequent Flyer Program and Etihad Airways' Etihad Guest will enjoy reciprocal loyalty program benefits, such as miles earn and redemption, priority check-in and boarding, baggage handling and lounge access across both networks. Between September and October, double miles will be awarded to Etihad Guest members traveling on any Philippine Airlines flight and to Philippine Airlines Mabuhay Miles members traveling on Etihad Airways flights. This agreement also allows Philippine Airlines Business Class guests and Mabuhay Miles Million Miler, Premier Elite and Elite members to use Etihad Airways' Premium Lounge in Abu Dhabi International Airport (starting Aug. 1) and London-Heathrow International Airport (starting Nov.1). Philippine Airlines and Etihad Airways also signed a letter of intent for an extensive capacity agreement based on the belly hold of all passenger services between Abu Dhabi and Manila, as well as connecting airfreight into Africa, Australia, the Middle East and Southeast Asia. The two airlines are also developing a joint air pass scheme which will enable overseas visitors to purchase an international flight to Manila and up to three additional sectors on Philippine Airlines' domestic network. This will enable travelers to visit more of the Philippines and provide a significant boost to the local tourism industry. The air pass is expected to go on sale by September 1, 2014. "We've Come Together To Take You Further." According to airlineroute.net, Etihad Airways and Philippine Airlines on Wednesday, opened reservations for codeshare service, for travel on/after July 10, 2014. Planned codeshare routes as follows. Philippine Airlines' five weekly flights utilize its new Airbus A330-300 aircraft which features a modern, two-class cabin configured into Economy (with a separate premium economy cabin) and an all-new, state-of-the-art Business Class. The Airbus A330 carries 368 passengers: 323 in Economy; 27 in a more spacious Premium Economy; and 18 in Business Class. Meanwhile, Etihad Airways operates two flights daily between Abu Dhabi and Manila using a Boeing 777-300 aircraft with 28 seats in Business Class and 384 in Economy Class.